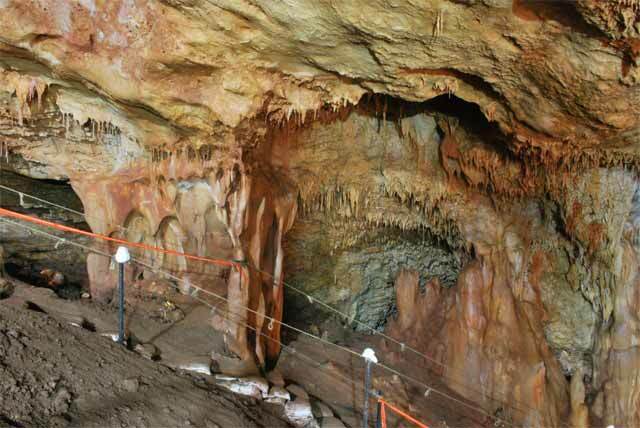 In July 2011 and July 2012, two seasons of excavation were conducted in Manot Cave (License Nos. G-60/2011, G-61/2012; map ref. 21835–45/77105–15). The excavations, undertaken on behalf of the Israel Antiquities Authority, Ben-Gurion University of the Negev and Tel Aviv University and funded by the Dan David Foundation, the Irene Levi-Sala Foundation and the Israel Antiquities Authority, were directed by O. Barzilai, O. Marder and I. Hershkovitz, with the assistance of R. Lavi, M. Goder, D. Igorov, G. Herzlinger and R. Ben Lulu (area supervision), D. Vaknin (administration), V. Essman and Y. Shmidov (surveying and drafting), B. Langford, M. Ulman and U. Davidovich (mapping), H. Ashkenazi and N. Schneller Pels (laboratory), L. Barda (map) and C. Amit (photographs) and students and volunteers from the universities of Tel Aviv, Haifa, Ben-Gurion and Bar-Ilan, the Hebrew University of Jerusalem and Case Western Reserve University of Cleveland, Ohio. Research partners included A. Ayalon, M. Bar-Matthews, A. Matthews and G. Yas‘ur (Geological Survey of Israel), G. Bar-Oz, R. Yeshurun and N. Schneller Pels (Zinman Institute of Archaeology, University of Haifa), E. Boaretto and V. Caracuta (D-REAMS Radiocarbon Laboratory, Weizmann – Max Planck Center for Integrative Archeology, Weizmann Institute of Science), B. Alex (Harvard University), S. Weiner (Kimmel Center for Archaeological Sciences, Weizmann Institute of Science), F. Berna (Simon Fraser University, Vancouver, Canada), A. Frumkin (Department of Geography, Hebrew University), D. Bar-Yosef (Tel Aviv University), U. Weiss (Department of Land of Israel Studies and Archaeology, Bar-Ilan University) and B. Latimer (Case Western Reserve University). We extend our thanks to Y. Ya‘aqobi, Y. Lerer, E. Stern and D. Barshad (the IAA Northern Region Office) for their support during the excavation seasons, to the Jewish National Fund for financing the opening of an operative entrance into the cave and to S. Dora and O. Boneh of that organization for undertaking that project. Manot Cave is an impressive karstic cave that was discovered by accident in 2008 during construction activity that damaged the cave’s chimney (Fig.1; Barzilai et al. 2012). It is located in the Western Galilee, c. 10 km north of Ha-Yonim Cave and c. 50 km northeast of the Mount Carmel Caves (see Barzilai et al. 2012: Fig. 2). The morphology of the cave includes distinct solution domes, smooth walls and a chimney, all characteristic of phreatic caves (hypogenic) that were formed below groundwater. The cave is located at an elevation of c. 220 m asl and c. 100 m above the regional water table; hence it was formed prior to the Pleistocene uplifting of the region. Later, intensive vadose activity occurred in the cave, which created cave sediments, stalactites, stalagmites, and many deep channels along the northern wall of the cave. It seems that some of this action took place at a time when there was human activity in the cave. The cave consists of an elongated hall (length 80 m, width 10–25 m; Fig. 2) and two chambers on a lower level that connect to the hall on both the north and south. The main hall is divided into three sections: a western talus, a leveled area and an eastern talus. Horizons of poor- and medium-quality coarse-grained flint are found along the walls of the cave. Fall rocks and active stalagmites apparently blocked the main entrance to the cave at the far end of the western talus. Presumably, the cave had two entrances: a steep, main opening on the west, and a smaller, more moderate secondary entrance that faced the streambed on the east. During the first excavation season (2010) the cave was entered by means of rappelling through the chimney. In 2011, a permanent opening, not the original opening of cave, was constructed to facilitate current research in the cave as well as future entry of visitors. 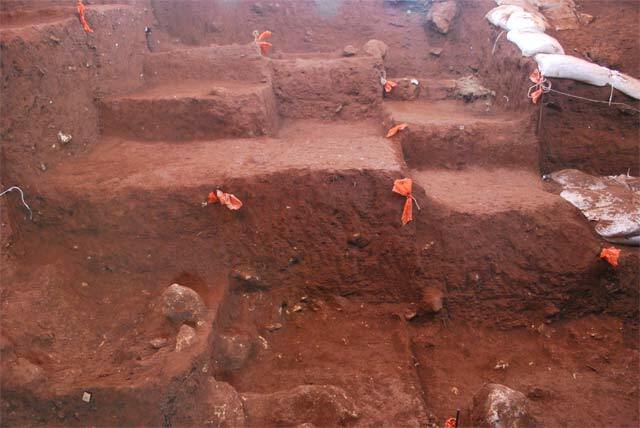 So far, three excavation seasons (2010–2012) have been conducted at the site. Nearly eighty square meters were excavated in six areas (A–F; Fig. 2). The excavation objectives were to document and retrieve the archaeological and archaeozoological finds; to locate the original opening of the cave (in Areas B, E and F); to document the geology of the cave, including the sampling speleothemes, for both climate research and uranium-thorium dating; to collect charcoal remains for dating the archaeological levels by means of 14C (particularly in Area C, and to a lesser extent in Areas D and E); and to conduct a sedimentological study in order to evaluate the processes of soil formation and post-depositional processes (particularly in Areas A, C and D). The excavation in the 2011–2012 seasons was concentrated in four areas: in Area C and in three new areas – Area D (2011) and Areas E and F (2012). 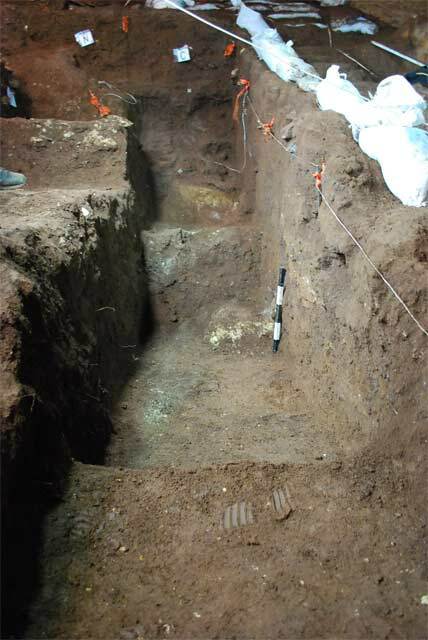 In Area C the excavation focused on expanding and deepening the existing area, and on attempting to define more accurately the archaeological layers; additional samples were taken for 14C dating and for uranium-thorium analysis, and a precise geomorphologic analysis of the sections was done (Square J/K66). Below is a description of the excavation areas and the initial results of the supplementary studies: archaeozoology, archaeobotany, bone and antler tools and absulute dating. Area C is located on a steep slope toward the bottom end of the western talus. In a survey performed prior to the excavation, Upper Paleolithic horizons were identified (Barzilai et al. 2012). Eight square meters were excavated, and a complex stratigraphy consisting of at least seven sedimentological units (Units 1–7; Fig 3) was revealed. The soil accumulation in Area C is a product of complex geomorphologic processes that included sequences of frequent events of colluvial deposition of paleo-terra rossa and its solidification. Human and animal (bats and carnivores) activity in the cave, as well as the flow and dripping of and water from the cave’s ceiling, took place between the depositional phases. It seems that some of the large limestone blocks (most of which are up to 0.2 m long) acted as “traps”, around which flint tools and medium and large animal bones (up to 0.1 m long) accumulated. Some of the items were found lying horizontally, while the rest were found inclined at an angle of up to 90 degrees to the surface (Fig. 4). 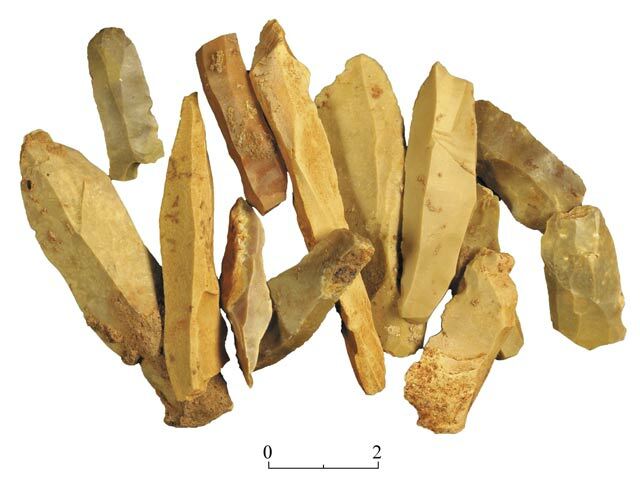 The paleo-terra rossa contained a wealth of finds, including flint items, stone items, animal bones, charcoal remains and shells, which were used for both ornaments and consumption as food. It seems that the multitude of small anthropogenic artifacts within the sedimentalogical units indicates minimal movement of the archaeological items across short distances. Area D was opened at the top of the western talus, where an ancient terrace inhabited by humans may have existed. Twenty square meters were excavated along the talus, and at least eight sedimentological units were documented (Units 1–8; Fig 5). Large concentrations of flint items, animal bones, grindstones and bone objects were found in these units; however, not one of the levels was in situ. 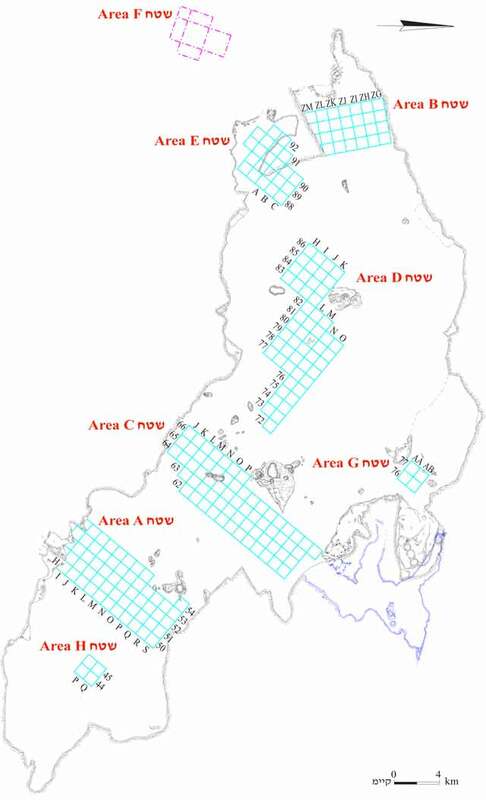 Units 1–8 were mainly composed of colluvial paleo-terra rossa that was found in all of the squares. 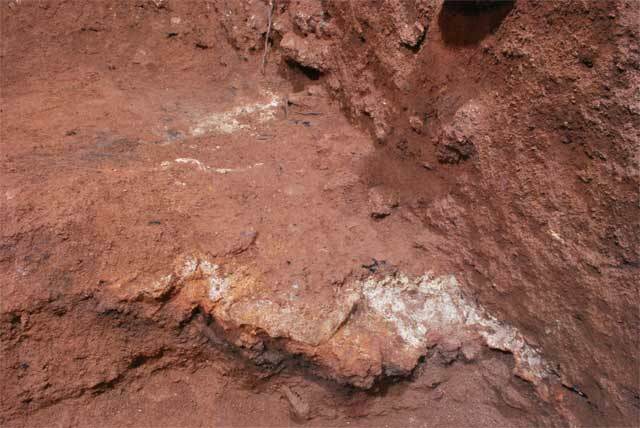 The excavation reached large limestone rock surfaces, either part of the cave’s floor or chunks of rock that collapsed from its ceiling. The upper part of the paleo-terra rossa has a loose texture, and its lower part is compact and consists of stones that originated from the erosion of chunks of rock. The remains of large herbivores, including a large antler of a red deer (Fig. 6), and dozens of hyena coprolites, were conspicuous in the upper part of the terra rossa. An accumulation of collapsed stalactites as well as breccia horizons with accumulations of unsolidified terra rossa were found in the southwestern part of the area (mainly in Square M79/80). Although the finds are not in preliminary deposition, most of the flint items from this area (retouched blades and bladelets, cores for producing blades and el-Wad points; Figs. 7, 8) are characteristic of a defined cultural phase – the Early Ahmarian culture of the Upper Paleolithic period. Area E was opened at the top of the western talus, near the putative cave opening, which was the most suitable location for human habitation. Twenty-four square meters were excavated to an average depth of one meter (Fig. 9). The purpose of the excavation was to remove the upper layers of soil and try to expose in situ habitation levels. The sedimentalogical section includes a colluvial layer and terra-rossa soil in secondary deposition that slopes steeply to the east and north (thickness c. 1 m). This unit comprises two sub-units: a loose, unconsolidated one, and a second, more compact one, with few coprolites and stone concentrations, which cut off and covered a sedimentological unit with more anthropogenic characteristics. 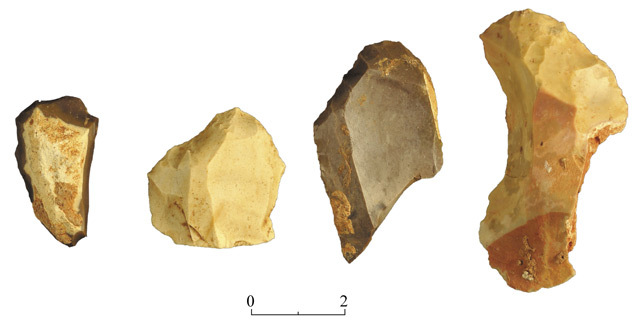 The latter, anthropogenic unit (thickness c. 0.5 m), was rich in finds, and included a thin occupation level (thickness c. 5 cm) that contained in situ flint tools, bones and charcoal fragments. Two hearths were discovered on this level. One of them (diam. c. 0.6 m; Square A92/93; Fig. 10) had white ash in the center and remains of red, burnt soil along its edges. Stone surfaces, which were not excavated, carrying flint items, animal bones, pieces of charcoal and bone tools were exposed at the bottom of this unit. The flint assemblage included mostly bladelet cores, twisted bladelets that are finely retouched on the dorsal and ventral sides and carinated artifacts. 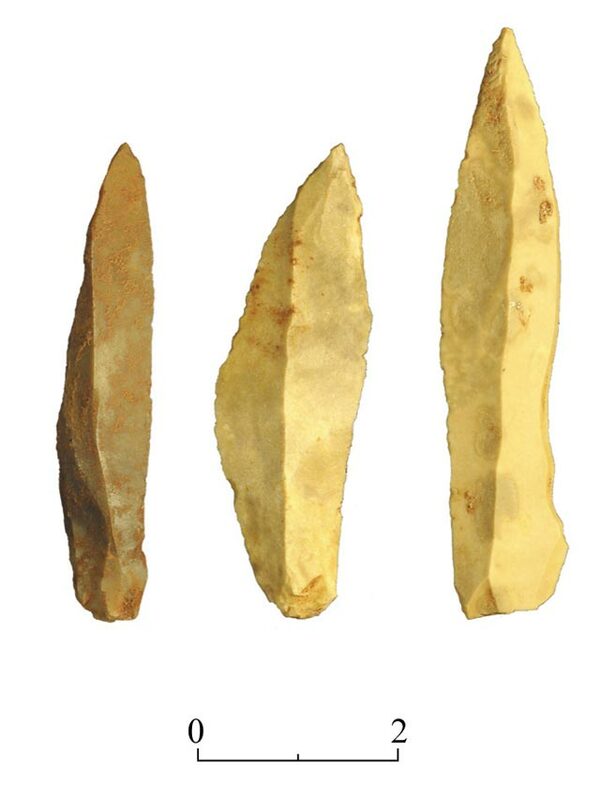 These tools are typical of the Late Upper Paleolithic period. Area F (c. 6 sq m) was opened on a terrace, south of the current opening, with the objective of locating the original opening of the cave. The excavation was halted when it encountered a massive stone collapse that might indicate the location of the original opening (Fig. 11). Almost no archaeological finds were discovered. The Faunal Remains. 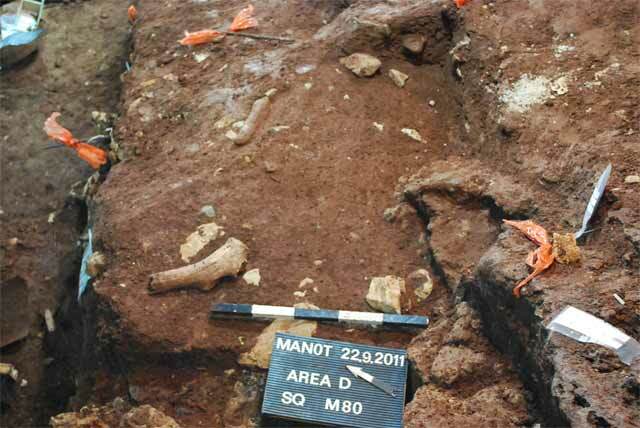 The large accumulations of well-preserved animal bones continued to be a conspicuous phenomenon of the finds in the cave in the 2011–2012 seasons. These seasons continued to reveal great differences between the animal remains collected from the find spots (the concentrations) and in the upper units in Area D, and the remains found in the Upper Paleolithic layers, particularly in Area C. Small animals, such as turtle, hare, fox, partridge and squirrels, continued to dominate the faunal remains in the archaeological layers in Area C. This area is also characterized by a higher incidence of gazelle (young and mature) and fallow deer than in the find spots and the upper units of Area D. In addition, most notably in Areas C and E, but also in Area D, there were numerous burnt bones bearing cutting and breakage patterns that resulted from butchering the animals and consuming their bone marrow. 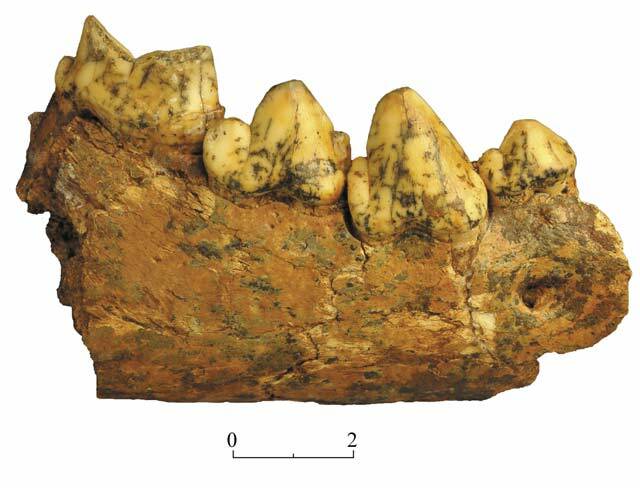 These preliminary observations suggest that both humans and large carnivores (particularly hyenas; Fig. 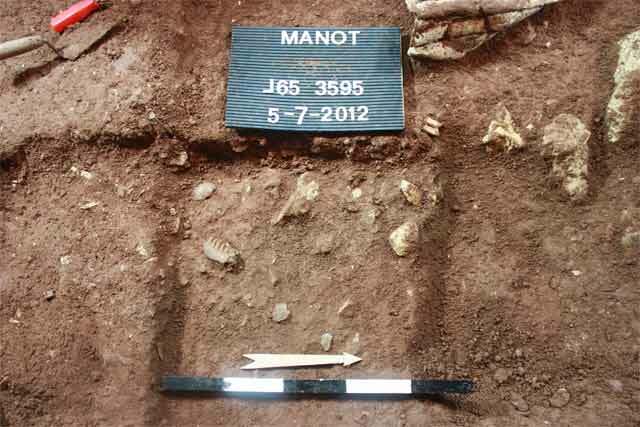 12) played an important role in creating the faunal assemblages in Manot Cave. The Botanical Finds. A preliminary identification of the charcoal pieces found in the excavation areas indicates a high incidence of Tabor oak and remains of another species, most likely almond. 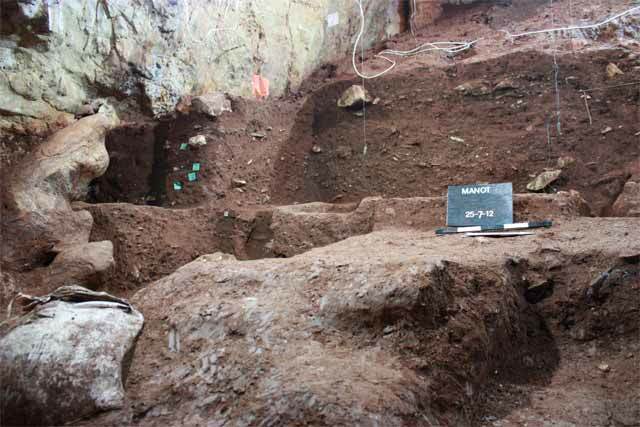 The botanical and faunal remains suggest that the cave was surrounded by a diverse environment that included Mediterranean woodland vegetation and open park forest. Bone and Antler Tools. Approximately forty bone and antler tools were found, mostly in Areas C and D, and several in Area E. The tools consist mainly of points, among them some bi-points (Fig. 13), and several awls. At least a third of the tools were produced from deer antlers – a fossil directeur for the Levantine Aurignacian culture that probably originated in Europe. Dating. The absolute chronology of Area C has been determined by using two dating methods: 14C and uranium-thorium (Marder et al. 2013). Several samples were dated. Charcoal remains found within archaeological sediments were dated by 14C. The calibrated dates retrieved by this method fall between 40,000 and 31,000 years BP. The uranium-thorium method was applied to flowstone layers found between sediment accumulations with archaeological finds (Square M65). The dates obtained by this method range from c. 41,000 to 33,000 years BP. The results of the two dating methods, along with a preliminary analysis of the lithic finds, indicate that the archaeological levels in Area C should be ascribed to the Early Upper Paleolithic period (c. 41,000–31,000 years BP). The cave was inhabited from the Middle Paleolithic period until the Epi-Paleolithic period (c. 250,000–15,000 years BP). The characteristics and composition of the flint tools, animal bones and bone tools indicate that the cave includes an almost complete cultural sequence of the Upper Paleolithic period (50,000/47,000–22,000 years BP). The following cultural entities were identified in the cave: (1) The Early Ahmarian culture (named after the site ‘Erq el-Ahmar in the northern Judean Desert) – a local Levantine culture characterized by a prevalence of retouched blades and bladelets and el-Wad points, which was documented mainly in Area D. (2) The Aurignacian culture – a combination of European characteristics, such as carinated end-scrapers (Fig. 14) and burins, bone tools and pendants, and local characteristics, such as el-Wad points, which was identified mainly in Area C. (3) A post-Aurignacian cultural entity of the Late Upper Paleolithic period, characterized by a prevalence of delicately retouched bladelets and carinated artifacts, which was documented in Area E. The excavation at Manot Cave contributes to the study and understanding of one of the most important phases in human history, associated with the dispersal of humans out of Africa, and is likely to contribute to reconstructing the fauna, climate and environment during this time period. Barzilai O., Hershkovitz I., Marder O., Ayalon A., Bat-Mathews M., Bar-Oz G., Boaretto E., Berna F., Frumkin A., Khalaily H., Weiner S. and Yeshurun R. 2012. Manot Cave. HA-ESI 124. Marder, O., Alex, B., Ayalon, A., Bar-Matthews, M., Bar-Oz, G., Bar-Yosef Mayer, D., Berna, F., Boaretto, E., Caracuta, V., Frumkin, A., Goder-Goldberger, M., Hershkovitz, I., Latimer, B., Lavi, R., Matthews, A., Weiner, S., Weiss, U., Yas‘ur, G., Yeshurun, R., and Barzilai, B. 2013. 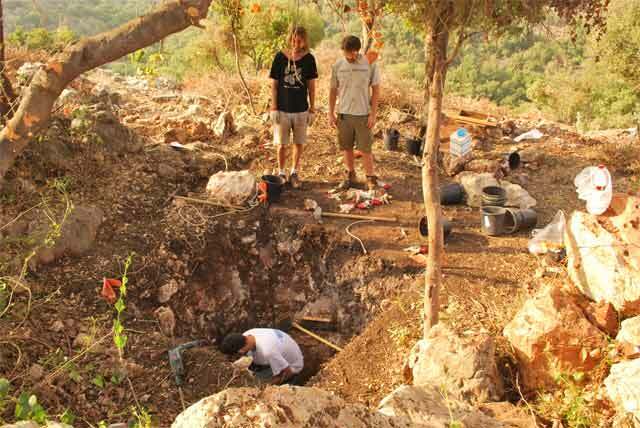 The Upper Paleolithic of Manot Cave, Western Galilee, Israel: The 2011–12 excavations. Antiquity 337 (87) (September 2013). http://antiquity.ac.uk/projgall/marder337 (accessed December 29, 2013). 1. A general view of the cave from Area D, looking north. 3. Area C, Section J/K66, looking west. 4. Area C, Square J65, a concentration of flint and bone items, looking west. 5. Area D, general view to the west. 6. Area D, Square M80, a red deer antler with gnawing marks made by a carnivore. 7. Area D, flint items: el-Wad points. 8. Area D, flint items: blades and bladelets. 9. Area E, general view; in the upper right hand corner is a hearth, and in the lower part of the picture – a stone surface. 10. Area E, Square A92/93, remains of a hearth. 11. Area F, the stone collapse above the original(?) cave opening. 12. Area D, a hyena jaw. 13. Areas C and D, a tool made of deer antler.